Ok … that is not the prettiest picture in the world but I had guests sitting in the dining room waiting for their dinner so it was a quick shot en route. Combine all ingredients in a large casserole dish and leave to marinate in refrigerator overnight. Preheat oven to 180°C and cook for 1 hour. Now even the most kitchen-adverse person could not object to putting ingredients into a dish. It gets easier … I don’t even bake it. I put the ingredients into a casserole dish that can go on the cook top over a low flame until the chicken is cooked through – no more than half an hour. And it gets easier … You will note the recipe calls for chopped apricots and prunes: I don’t bother chopping them. The only proviso I would note is with regard to the prunes: firstly, I halve the amount. I think the dish would be just too sweet for western tastes with the full 1½ cups. Secondly, the type of prunes called for (as in all savoury dishes with prunes) are not the rehydrated ones found in the supermarket but dried prunes (which are much like dried apricots). I don’t know where you can buy them. I am lucky because I dry my own. If the only prunes you can get are from the supermarket, I wouldn’t soak them overnight. I wouldn’t even cook them. I would put them in the casserole just long enough to heat through. You may also want to slightly reduce the sugar in the recipe because they are pretty sweet. I have made this recipe several times and each time it was a hit. I found the recipe on the web years ago. I guess I was searching for dishes featuring prunes as I have two prune trees and you can’t eat prunes and custard everyday! I have no idea where I found the recipe because, in those days, it never occurred to me that it was important. I just printed the recipe and put it in my book. Tonight, in an endeavour to give credit where credit is due, I went searching for the source. I found the exact recipe on foodlovers.co.nz but the font is different from my printed version so I don’t think that is where I got it. I kept searching, coming across a lot of recipes for Mediterranean Chicken with Prunes and Apricots – here is one of them. The ingredients are the same but the quantities are different and there are a couple of steps to the instructions. Still, it is a very easy recipe and looks very tasty. Clearly, this recipe was the source of my homecook-modified version but I still was unsure about the origin of this recipe. I then came across Prune and Olive Chicken which was the same as the Mediterranean Chicken with Prunes and Apricot recipe but without the apricots. I was reading the reviews and noticed one reviewer’s comments: ‘This is definitely classic chicken marbella’, she wrote. I searched Chicken Marbella and hit a jackpot. It is the same recipe minus the apricots. Chicken Marbella is a recipe that first appeared in the Silver Palate Cookbook 1982 by Julee Rosso and Sheila Lukins. I have never heard of the book but, clearly, it was a best seller in the States at the time. The whole exercise has been very interesting. After all my digging, I am now keen to try the Chicken Marbella recipe and a little embarrassed to offer my twice-removed version from an unknown source but, trust me, it is very, very tasty and it could not be easier. Serve with couscous and green beans. This entry was posted in Chicken & Duck, Something Simple, What's for dinner? 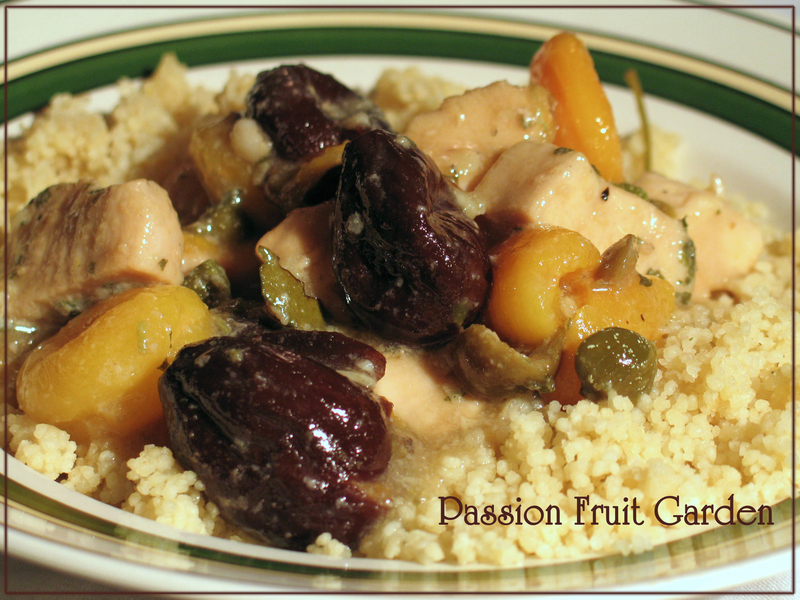 and tagged Chicken Marbella, Chicken with Prunes and Apricots, Chicken with Prunes and Olives by Glenda. Bookmark the permalink. I Lisa, I do have a tagine. You are so right it would be perfect. I want this next time we’re invited over!!! Hi Al, no probs but YOU have already had it. Hi M You will like it. I am going to try Chicken Marbella now. Back in my pre-blogging days, I rarely, if ever, wrote down the source of a recipe. There was no need for I wasn’t planning on sharing them. Ha! I have posted a few of them, after trying to find the sources. I’m normally not successful and, like you’ve just done, make mention of it. What else can we do? As for today’s dish, I love how easy this is to prepare. I can see why you would serve this to dinner guests. Who wants to be stuck in the kitchen when there’s a party going on “out there”? Thanks for sharing it with us, Glenda. Hi John, I found the evolution of the recipe fascinating. I guess this is what happens to all recipes I just hadn’t turned my mind to it.